Aligned, Tuned and ready to race! 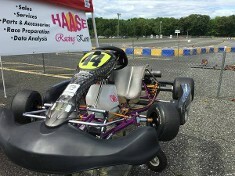 All Haase Factory updates, kart has had limited use and is not flexed out. Buyer Beware: Many karts that are sold used are no longer supported for parts from the kart manufacturer. Also many karts are not current or not currently competitive. 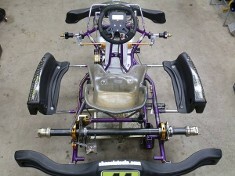 This kart is still supported by Haase, has all the updates and can does run up front in its current trim. Kart comes complete with Yamaha KT100 engine, new L&T 2 disc clutch, Woltjer carb, motor mount, chain, air box, completely assembled and ready to race.